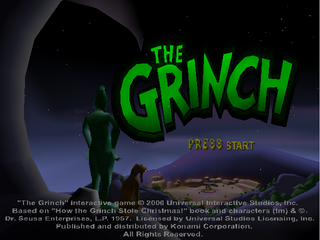 The Grinch is a video game based on the film Dr. Seuss' How the Grinch Stole Christmas. The game was released shortly after the film hit theaters. On the top of Mt. Crumpit, his eye pressed to the telescope, the Grinch observes Whoville. He mumbles something that his dog Max hardly perceives: "I've got it! I have a great idea! This year, the Whos will pay!" The Grinch just despises Christmas and this year, he wants it to end. "That, in fact, is the misanthrope scheme. Build gadgets from blueprints. Halt the holiday theme". He enters into his spacious cave to decide which of his gadgets he should build first. The Grinch the blueprints include such inventions as the Rotten Egg Launcher, Slime Shooter, Binoculars, Octopus Climbing Device, Rocket Spring, Grinch Copter, and Marine Mobile. He then makes a decision, but before he can get to his gadget, he slips on one of his boxes, resulting in his blueprints getting blown out of his cave. But the Grinch doesn't let this debacle stop him. He takes out his notebook and makes a few schemes that's sure to ruin the fun for everyone. Mount Crumpit stands in the middle of Who land; this is where the Mean One lives! This is also the location of his prized Grinch Computer, vacuum tubes, Grinch Rocket Sled, and the mini-games. This is where most of the Whos live. There, the Grinch must be careful not to arouse their attentions. He must be quick to dodge the Whos' hugs and attacks. While there, he must collect all possible blueprints, and return later to gain further access to certain areas. Tasks: Shuffling the Mail (5), Smashing Snowmen (10), Painting the Mayor's Posters (10), Launching Eggs Into Houses (10), Modifying the Mayor's Statue, Advancing the Countdown to X-Mas Clock, Squashing All Gifts (500). An enchanted place filled with little houses, beautiful trees, a magnificent ski station with an old-fashioned style chalet and all those happy Whos practicing their skiing skills. The main focus aside from two other missions is slime the Mayor's skis. To do this, he'll have to visit cabin number 2 and squash the bees guarding a security card. Tasks: Making Christmas Trees Droop (10), Sabotaging Snow Cannon With Glue, Putting Beehives in Cabins (10), Sliming the Mayor's Skiis, Replacing the Candles on the Cake With Fireworks (10), Squashing All Gifts (750). For the Grinch, Who Dump is a real paradise. He enjoys its smelly aromas and he finds lots of food, pieces of equipment for his gadgets, and above all, there are almost no Whos. In the tranquility of Who Dump, in the garbage and the scrap pieces, he can plan tricks to play on the Whos. The biggest task he can do here is to shut down all power so that many paths are permanently unblocked. To make that happen he'll the Octopus Climbing Device and the Slime Shooter. It's the annual Jamb-Who-Ree on Who Lake! Of course, the Scoutmaster of the event is none other than Mayor May Who, assisted by Who-Bris. There certainly are a couple of pranks to be played on May-Who, Who-Bris, and those little scouts. In fact, Who lake inspires more missions to the Grinch. For in this area, the Marine Mobile can help in finding the last of the blueprints and complete a great deal of missions. To progress from one area to the next, players must complete three missions in all (excluding the Squash all Gifts Missions). Below are a few secrets to the game. I hope they are useful. Blueprints Whoville: Rotten Egg Launcher(4) Binoculars (4) Whoforest: Rocket Spring(9) Slime Shooter (9) The Dump: Octopus Climbing (9) Wholake: Marine Mobile (16) The Grinch Copter's pieces are found on every level, four pieces on each one (16 total). Mini-games When the Grinch destroys gifts, he unlocks mini-games. To unlock the last one, players will have to get 100% completion in the game. Main article: The Grinch/Magazine articles.